So many unexpected adventures are coming along with having this space for a studio. 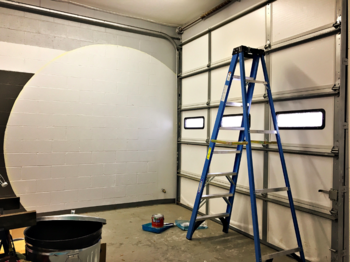 I painted around the big 10'x10' door on Tuesday. It was the last painting I did before leaving so the door wasn't opened again that day. On Wednesday I couldn't open the door at all. No amount of pushing, pulling, lever-ing... I may have rearranged some internal organs with the effort but no movement from the door. The only cause I could think of was the paint. Could that little amount of paint keep this big heavy door from opening? Apparently so. I went back up the ladder with a putty knife and worked it between the door and the wall. I couldn't tell that the knife was removing any paint or breaking any seal. On the next try the door opened easily. Can I please get back to painting? Or rather, can I please get back to preparing to paint? On the cinder block walls I kept it simple and used the lines of the block to separate the colors. The rear wall is drywall so no handy lines. That means tape and since I'm not going for abstract that means level lines of tape. Next challenge. When the ceiling isn't exactly level, positioning a tape line by measuring down from the ceiling really doesn't work. I could measure from the floor but when the line extends over the wall of the bathroom... Gravity to the rescue. Back up the ladder with a level in hand. I made a joke to a friend about getting myself up above the loo only to lose track of the ladder. Very funny, Alicia. Know what? A level makes a great tool for lever-ing a ladder back into a safer proximity for descending from high places.